Consisting of 80 acres of lush woodlands in the heart of the West Lancashire countryside, Tawd Vale has long been a favourite site for generations of campers. The River Tawd from which the site derives its name wanders through the centre of the camp and adds to the natural beauty of the surrounding area, a place of fun and adventure. Everyone is welcome, from young and old, to come and camp and join in all the activities. Over the four days there are lectures, demonstrations, 'how to' sessions and activities for all the family. With large flat grass glades and banks of mature trees you will always find a great pitch at Tawd Vale. You are able to park on hard standing areas close to your tent pitch. For those who prefer to use a hammock and tarp you can pitch camp in the woodland area. Within Tawd Vale is a flooded quarry known as The Delph. This is available to use for those with canoes but you need to be self-reliant, please ensure you have all necessary safety equipment. Dogs are also welcome on site but must be kept on a lead. The focal point of the RV is the Tamarack HQ. The Tamarack Team are based here co-coordinating the event, answering questions and are always on hand for any technical equipment queries. 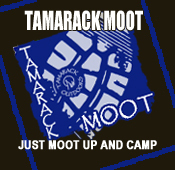 The HQ is also where the team will be running the Tamarack Rendezvous Mini Store for all those essential or forgotten items. RV2018 will also see the return of the Tamarack Café. Based at the HQ the Café will be serving breakfast and then tea, coffee and cakes for the rest of the day. On two nights an evening meal will also be available - Friday is Game Stew and Saturday is Venison Burgers. For 2018 we are introducing the Rendezvous Trading Post. The idea came from Mike at the RV2017 where he brought along a box of second hand outdoor clothing and equipment and nearly sold the lot. 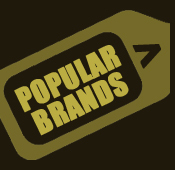 So if you have some outdoor related kit bring it along and sell it direct from your tent or tarp. The rules are that the kit has to be clean, well maintained and serviceable with a price label attached. Tawd Vale Camp Site was the new venue for 2018 and what a venue. 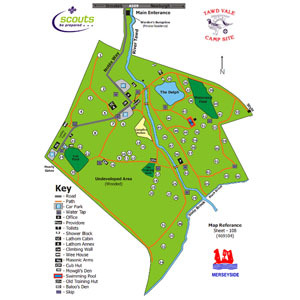 The 80 acre woodland site is perfect for the RV with loads of different plant and tree species, the river Tawd dissecting the site and the Delph which is great for course fishing and paddle practice. This year the weather was kinder with the camping fields dry and flat which is a bonus. The Tamarack HQ building and kitchens worked really well with loads of room for our shop, a mess hall and a great space for lectures. With a new site comes new ideas and at Tawd this is no exception. Mikes wild and woodsmans walk proved successful along with the usual suspects of wild game preparation, cutting tools safety and an afternoon of tarps, hammocks and knots. Mike and Dave Winrow ( alias the woodland brothers ) were on hand teaching people leather work, wood turning with a pole lathe and many other aspects of an outdoorsman. Also the team from Wood-Sage were running the ranges and the family crafts which are always busy. As always the RV party on the Saturday evening was a success with great positive feedback about the site and how the RV is run. Throughout the RV 18 we were processing the feedback and starting to organise RV 19 and looking forward to meeting all the great people who attend each year. 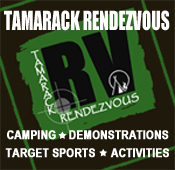 Details of the next Tamarack Rendezvous will be coming soon. The information bar on the right is where you can find useful information regarding types of ticket and details of the venue. Full itineraries for the event are currently being planned and will be posted below. This covers all camping fees and includes all workshops & activities.